Ahoy mates! Welcome to the House of Jitters’ tribute to Stan Lonergan, George Baseleon & The Captain Jinks Show. Stan Lonergan (LAWNer gun) as Captain Jinks and George Baseleon (Bah SILLY un) as Salty Sam were a most beloved team who hosted the charming children’s program. Residents of central Illinois remember the Captain and Salty with great fondness. 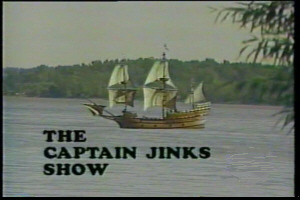 The Captain Jinks Show was in fact the most watched and longest running local children’s show in the history of the region. Each afternoon after school, kids (and adults) were invited to come aboard the SS Albatross to join in the fun. Cookie (whose arm was the only part of him to be seen), the talking parrot, local magicians, animal handlers and the like joined the Captain and Salty. During the show’s height of popularity, children who wanted to be in its audience would wait on a list for up to a year’s time. The draw of the program was in the personalities of these two men. Stan Lonergan was a quick-witted yet low-keyed improviser whose quips often went over the head of George Baseleon. Yet what George lacked in spontaneity and keenness, he more than made up for in genuine warmth and sincerity. In short, they were a perfect complement to each other. 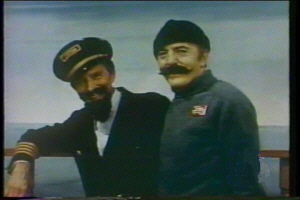 An early picture of Captain Jinks and Salty Sam, probably 1960s. Promotion manager for WEEK at the time, Bill Adams, called Lonergan, "one of those people who could be very ordinary, yet very complex at the same time." In the earliest days of television, popular radio programs were molded for the new medium. 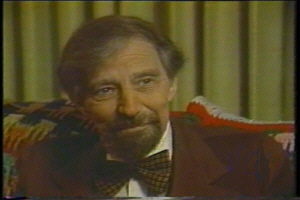 Those old radio shows each had a host that would introduce the episode. When radio programs made their jump to television, the tradition of the host and announcer came along with it. Not much time passed before TV programming began catering to children and local television stations purchased cartoon packages to entertain the kiddies. One popular package was the Popeye cartoons and stations across the nation began to create kid shows with a nautical theme to capitalize on the acquisition. The Captain Jinks Show was one such creation. The Captain Jinks Show began in 1956 with a different Captain than the one we came to love. Hal Searles, also known on radio as Johnny Dark, started off as Captain Jinks before moving on to WBBM. 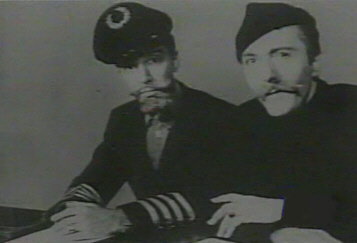 In 1957 Stan Lonergan took over as the Captain. A title card for the '70s iteration of the show. Stan was born and raised in Chicago and grew up an ardent follower of radio. By the time he was 17 his Aunt Stella Ketchum had noticed his love of the medium and financed his entry into the College of Radio and Drama. From there he went into the Chicago Junior League Radio Theater and by the forties he was doing big band remotes for local radio. In 1944 he married Jean Fisher and would have two daughters, Carol and Susan with her. During this time he went to work for WGN and played a visiting nephew on “The Baxter’s” as well as working on “College Humor” and “Uncle Walter’s Dog House.” From WGN he went to WIND and then worked six years at WCFL. By the time the early fifties had rolled around his domestic life was suffering and in 1952 or 1953 he divorced from his wife of eight years. While working at WJJD in 1955 he sent tapes of his work to WEEK in Peoria and was hired for a radio show. When he first moved to Peoria he lived in a room behind Hunter’s Café. Larry Thorhaug, a WEEK engineer, soon befriended him and invited Stan to room and board in his residence along with his wife Estelle. Stan stayed with friends Larry and Estelle Thorhaug in their home at 814 Cooper Street near Bradley University for almost the rest of his life. 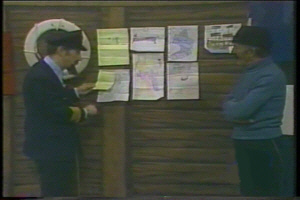 The Captain Jinks Show enjoyed popularity from the very beginning. Even without a script or writers, Stan Lonergan was never at a loss for words. His amusing, affable personality connected with his viewers and the live show proved a great training ground. In 1960 the weekend weatherman, George Baseleon, joined Stan. George had been approached to play the Captain’s first mate, named Salty Joe. George accepted on one condition -- get rid of that name! George came up with the more enjoyable alliterative Salty Sam. By the mid sixties the show had been expanded from one hour to two and a half hours. 40,000 requests for 8x10 photos had poured in and they had 76% of viewers tuning in. Fan clubs in college campuses and even in a local tavern were formed! Part of the success of the show was due to the work of promotion manager Bill Adams. 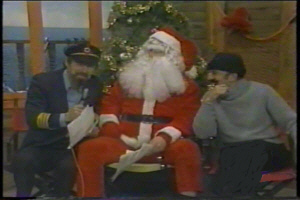 Bill was the one who attached Captain Jinks and Salty Sam to the Santa Claus parade and the annual Breakfast with Santa. For many children seeing the Captain and Salty at the parade was as much a highlight as seeing Santa. Captain Jinks and Salty Sam also became connected in the minds of many grateful parents with their visits to children in hospitals. Santa Claus pays a visit to the SS Albatross. Stan Lonergan in his later years with his real beard. "Time kind of hangs on you. I don't socialize much. I read quite a bit. I rather enjoy Agatha Christy novels." 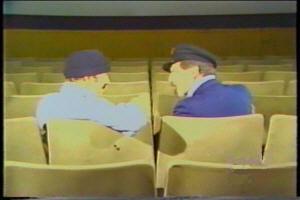 1972 saw The Captain Jinks Show leave the air, but in 1978 the show returned, taping multiple episodes twice a week. Eventually another character, Bosun Joe, played by Joe McGuire, joined the program. Characteristic of this style of children’s show, Bosun Joe would draw caricatures and cartoons or begin a drawing from a squiggle and create a face out of it. Towards the end of the program’s run, Bosun Joe, a fan himself, took over the show. In 1981 The Captain Jinks Show was cancelled. Stan Lonergan continued to do some voice work for the station as well as radio spots. He and Salty Sam continued to visit kids in the hospitals and meet Santa for their yearly breakfast. The monetary compensation they both received over the years for their work was small and eventually George took work as an assistant manager for the Heritage House restaurant. On busy Saturday nights he might sign two hundred autographs. Stan worked as a security officer for a while at Jumer’s Castle Lodge but basically retired. George Baseleon passed away in December of 1985. He had one daughter, Christine. Stan put the Captain’s coat away for good after George’s death. Stan Lonergan developed cancer in the late eighties and passed away at the age of 67 on October 15th, 1989. All sadness aside, Captain Jinks and Salty Sam brought so much joy and happiness to so many kids and adults that they’ll be dearly remembered for many years to come. The Captain Jinks Show and its bucket game, the corny jokes from the joke barrel, the clever, improvised one-liners from the Captain and the contagious laughter from Salty Sam will stay with us forever. Stan’s quiet humor, slightly mischievous, and George’s kind, light-hearted manner were a part of our childhood and are now hopefully a part of us. More wonderful pictures at this great Captain Jinks site. Please share your memories of the show on our Guest Book. Mr. Toyman (Gary Gresham) on channel 19. Miss Mary on Romper Room. Hobo Kelly (Sally Baker) eventually moved to L.A.
Bozo the Clown on channel 31 in the early sixties. Captain Ernie's Cartoon Showboat sailed in neighboring Davenport, Iowa. Adams, Bill. 1989. "Captain Jinks cornered the market in central Illinois." In Journal Star, Peoria, July 3, D1, D3. Adams, Bill. 1989. "So long, matey..." In Journal Star, Peoria, October 30, D1, D3. Becker, Joan. 1984. "Captain, Salty share jolly memories." In Journal Star, Peoria, October 28, D1. Bridges, Derek. 1990. "Captain Jinks legend auctioned to his fans." In Journal Star, Peoria, January 28, A18. Hollis, Tim. 2001. Hi there, boys and girls! : America's local children's TV shows. Mississippi: University of Mississippi, 2001. Towery, Terry L. 1989. "After George (Baseleon) died, Stan put up the outfit. He was never Captain Jinks again." In Journal Star, Peoria, October 22, B15. Obituary. 1989. "Stan Lonergan, Capt. Jinks on television, dies at 67." In Journal Star, Peoria, October 16.